The Big Picture The Big Picture | Uh oh: Forbes Cover Screams "Tech is Back!" 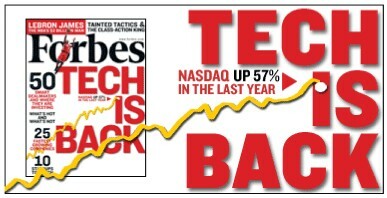 Uh oh: Forbes Cover Screams "Tech is Back!" "The covers of national news magazines and business publications show what’s making news today. The markets, on the other hand, are a future discounting mechanism, anticipating future events, and reflecting them in price and trend. Magazine covers sell magazines. Covers stories are featured because they are resonating with the public at that exact moment. When an editorial committee decides something is worthy of their publication’s highest profile [the cover], it often is just as that trend has is reaching its climax. Why does this work as a contrary indicator? When a magazine covers focus on the Bear Market for example, it’s already been fully priced into the market. Whatever response the magazine engenders is typically the last spasm of its cover subject. For more details, see our discussion on Contrary Indicators . . .